Eat vegetables and fruit (soft fruits, grapes, figs etc) from walled back garden, which is secure for dogs or children. Dogs and horses welcome, all year round. Horses can stay in our courtyard stables, or in field. Cot available for younger guests. Secure front garden for children with climbing frame and swing set (used at own risk). Vehicles can be parked outside front door. 2 bedrooms, 1 double, 1 twin and 1 set of bunk beds. 4 star graded by tourist board. Sleeps 6. Door ways wide enough for wheelchair users. Bathroom has large shower cubicle, and bath. Linen and towels are provided, but please bring your own beach towels. Property is set 100m from the road, next to owners Manor House. 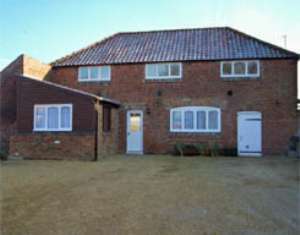 Set in large garden, stable/grazing available for horses. Pick veg and fruit from kitchen garden. Children welcome from any age. From A17 take turning signposted Terrington St Clement, African Violet Centre. At T-junction turn right and immediately left, this is Churchgate Way opposite pub King William are gates to Manor House. From King's Lynn 505 bus to Spalding boarded at bus station. Nearest train station is Kings Lynn, taxi needed to house from station.